The atmospheric electronica of Woob is cinema of the mind with few peers: cerebral, musical, vivid and emotional. In particular, the first two Woob albums - released in on the legendary UK ambient label Emit Records - are among the most refined, subtle and innovative examples of the meeting between electronics and live instrument sampling that flowered during ambient dance music's first wave in the 1990's. The atmospheric electronica of Paul Frankland aka Woob is cinema of the mind with few peers: cerebral, musical, vivid and emotional. In particular, the first two Woob albums - released in on the legendary UK ambient label Emit Records - are among the most refined, subtle and innovative examples of the meeting between electronics and live instrument sampling that flowered during ambient dance music's first wave in the 1990's. 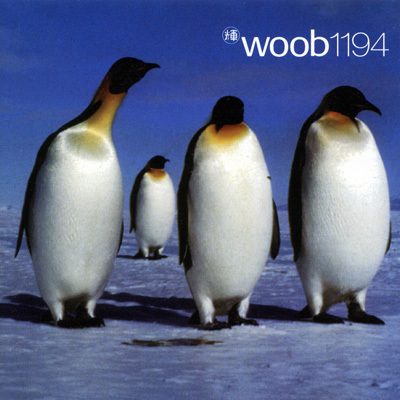 The first Woob album - the "penguin one" or simply called Woob 1194 (2004) - is highly revered by Emit fans and arguably the greatest single artist album the label ever released. It's a hybrid of melodic synthscapes, slow tribal grooves, avant-garde sound collage and Third World instrument sampling that defies mere categories. The ideas are so focused and execution is so assured that even the 30 minute opener "On Earth" doesn't drag. The visuals are strong; some tracks play like a surreal movie allowing the listener any number of interpretations. It's music of light and shadow, capable of making you melt or making you jump. "Strange Air" builds tension slowly, playing with synth drones and dialogue samples from an old suspense film for over 10 minutes before suddenly scaring the hell out of you. Not too far from Woob 1194 in sound and style is the wonderful Mama 6 (1994), the first of two albums which Frankland recorded around this time for UK beats label Ninja Tune, as one half of the duo Journeyman. While it doesn't quite match the first Woob album for surrealism or weird narrative power, there's plenty to like in its warm funk basslines, crystalline arpeggios and the familiar enveloping clouds of synthetic chords and strings. The grooves are derived from dub or early house, sometimes both within the one track as the composer explores a single theme using markedly different tempos. The album's highlight is the stunningly beautiful melodic epic "Latneiro (Woob's Sunrise dub)", a chillout room classic of its era and one of his very best creations. Woob 4495 (1995) takes another surreal journey but this second album is markedly different from the debut. This time it's though some deep, dark tropical jungle teeming with life, an aural travelogue filled simultaneously with visions of beauty and lurking, unseen menace. Once again, Franklin's mix of electronics and live instrumentation is quietly dazzling - drums, bass, electric guitar - and here he adds further to his palette with some smart touches of flute and piano. There’s less melody and harmonies and more thumping, dubby grooves than on the first album, though the 25-minute “Depart” drops the beats to a whisper and opts for a dreamy, disorientating flight through some mountainous inner landscape. After the 1990's, Paul Frankland largely disappeared from view, though he remained active in the industry including a stint as a sound engineer for filmmaker Ridley Scott's production company. Then suddenly he returned to releasing in 2010 with a new Woob album: Repurpose (2010). This is the start of the Woob reboot, which has turned out to be the most prolific period of his career. Five albums from this period stand out. Repurpose is an unexpected delight. Two long new tracks bookend the release and showcase the Woob universe in all its distinctive glory: shimmering, pulsing loops of tonal colour, creepy movie dialogue, lush orchestral and choral samples, slow euphoric crescendos and widescreen sound design. "85-bit" has a lot of fun with old synth sounds including a Commodore 64 computer yet somehow sounds rather timeless. It slowly builds intensity, starting with a loop of ravishing strings before segueing into a chugging, Berlin-school ambient monster with multi-layered melodies. Sandwiched between these two new epics are some remixes and reinventions of older Woob tracks. The remixes are generally warmer and more tonal than the originals, the exception being the dark and cinematic "Stranger Air", a direct nod to "Strange Air" from his debut. Return To The City (2011) is the soundtrack for a short film based on timelapse footage of Tokyo shot by collaborator Samuel Cockedey. Given the picturesque qualities of Woob's music, doing a film soundtrack is perfect for him, of course. Over three long, sci-fi tinged tracks Frankland builds huge walls of orchestral-like sounds, hovering somewhere between electronic and acoustic music, adding bells, lovely drones, grungy electronic beats, wailing voices and a 1000 other details. It's moody as hell; beautiful, a little frightening, totally involving. Listen to it at volume. Ultrascope (2013) is also impressive, a collection of dark widescreen music for head trips and 3D adventuring. Whereas Return To The City had an urban future noir quality to it, this one maps an altogether more alien terrain. The title track surges and sighs with a dramatic string-laden melody, big drones and thundering drums. "Horizon Vector" is one of several tracks that uses a Berlin-school arpeggio but in this case slightly detunes it, giving off that surreal air that Woob does so well. The 24-minute "Ultrascope II" veers between gorgeous, soaring synth chords and dark, sustained strings that hover as if in suspended animation, skirting the edge of outright dissonance without tipping you into the abyss. Of course it's all very cinematic - a Woob trademark - and the music would be a perfect foil for Ridley Scott's Prometheus visuals instead of the purely functional atmospherics that passed for most of that film's score. 2014 marks the 20th anniversary of his classic Woob 1194 album, an event marked by the release of Lost 1194 (2014). It's not a remix album, but rather a work conceived in an alternative universe and parallel timeline that's not hugely from the original. The same musician, the same studios in Nottingham, the same year, but different live "passes" of the same compositions and collages. Yet neither is it an album of outtakes, those discarded not-good-enough pieces that are an inevitable part of the creative process. No, this is a genuine alternative version of the original; close enough to be on the same level of greatness, different enough to delight longtime Woob fans. The standout is the alternative version of the creepy "Wuub". Whereas the original track began by cutting into proceedings quite suddenly, this time the tabla drum loop and glistening two-chord synth progression builds from beatless beginnings to an ecstatic slow-motion crescendo. Finally, there is Adpation (2015), Woob's stunning venture into retro horror territory. It's an imaginary score to an 80's horror film starring a lonely seaside village, a girl in trouble, and an abandoned game arcade that comes to life and turns the locals into the undead. It's spectacularly atmospheric; a melodic, richly textured tapestry of ghostly breakbeats, old movie samples, beatless suspended strings, 8-bit arcade game sounds and - unusually for a Woob album - two slamming pieces of dark progressive trance. The album unites two of the composer's passions - cinema and video games - and hangs together in its own unsettling dreamlike way, marking another highpoint in Woob's catalogue of exotic electronica. “Broken Console” is a standout with its 8-bit bleeps arranged into a dense, fast-spinning melody and dressed in wispy harmonies, a haunting and incredibly beautiful thing. With the early Woob and Journeyman CD's long out of print and fetching ridiculous prices on internet auction sites, digital download stores including Paul Frankland's own www.woob.info are the best places to find his albums.